In 2010, a Minneapolis-area cigar shop called Tobacco Grove introduced a store-exclusive Tatuaje Black in a Petit Lancero (6 x 38) format. Only 200 boxes of 25 were made for a total production run of 5,000. They sold out almost instantly. Later, Pete Johnson turned the vitola into a regular release. The only difference between the two cigars—aside from the production numbers, of course—is the Tobacco Grove Petit Lancero had a pigtail cap and a closed foot. For those unfamiliar with Tatuaje Black, the line was launched in 2007 in a Corona Gorda size that came in ceramic jars. Known as Johnson’s personal blend, some consider this cigar to be one of the best ever made. That hasn’t stopped Tatuaje, or Pepin (who makes Tatuaje for Johnson), from putting out excellent cigars. Nor has it prevented the Tatuaje Black from being reissued and expanded. Of all the different Tatuaje formats over the years, though, the Petit Lancero is one of the best. This wonderful cigar is a mottled, slightly reddish Nicaraguan puro that’s not without its fair share of veins. It is moderately spongy in firmness. The wrinkled, textured wrapper leaf is incredibly oily; it’s almost velvety. The cold draw is smooth. At the foot, pre-light notes include cocoa and molasses. At the outset, the spice-forward flavor is medium-bodied with well-balanced notes of oak, cinnamon, chocolate, and white pepper. The texture is thick and leathery. After half an inch, the spice recedes a notch to make way for a little sweet cream. The retrohale is occasionally characterized by a flourish of roasted nuts. 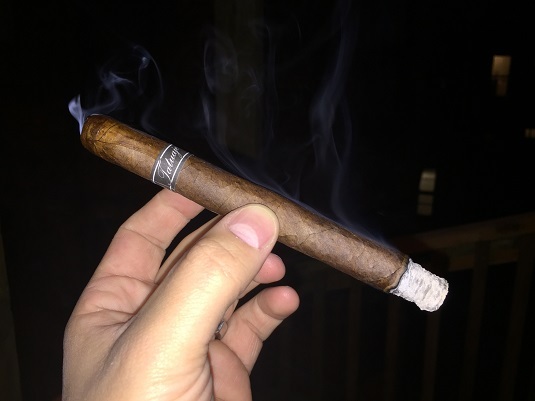 At the midway point, the Petit Lancero calms considerably in terms of both body and spice. Then, in the final third, there is a reprise of strength and spice, along with peanut, dark chocolate, and dry cedar. All the while, the construction is excellent. Expect a straight burn line, easy draw, solid white ash, and good smoke production. It’s hardly a surprise to me that I really like this Tatuaje Black. I love the size—it’s enough to be satisfying without overstaying its welcome, and the narrow ring gauge helps to concentrate the flavors—plus most Johnson/Pepin creations tend to resonate well on my palate (I’m not the only one). This classic-tasting, medium-bodied cigar scores very well due to its ample complexity and harmonious balance. I rate it four and a half stogies out of five.